Check here for periodic bits of news and updates! Looking forward to spring already? Join us in April at Ice & Fire Con 2019 for ASoIaF/GoT themed games, panels, cosplay, merchandise and MORE! Weekend passes are available now, and don’t forget to use code RADIO at checkout to save $5. Hope to see you there! Tickets are on sale now for next year’s Ice and Fire Con! Don’t miss your chance to join in the fun at the premier fan run A Song of Ice and Fire convention. Games, cosplay, panels, fandom favorites and more! Click below and enter the code RADIO at the checkout to save $5 on your weekend pass. Hope to see you there! Lady Gwyn will be at the Nashua Public Library’s ComicFest in Nashua, NH on Saturday July 22, with a presentation on Storytelling and Worldbuilding in Westeros. Check out the NPL website or watch our Facebook page for more information and updates. As of 13 November 2016 we’ve gone live with our Patreon campaign. 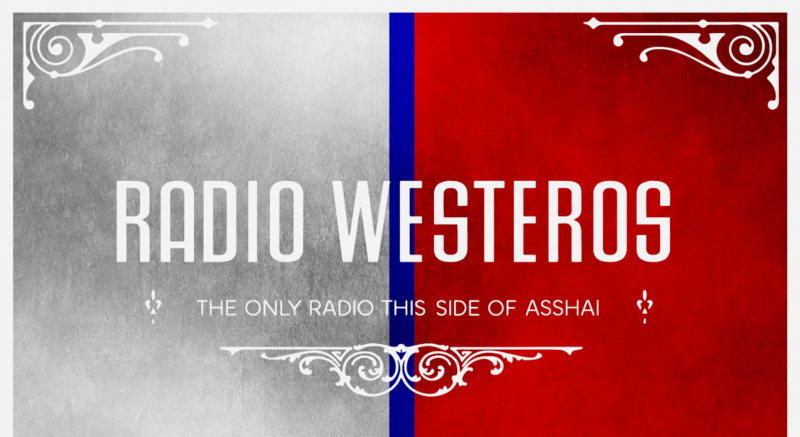 Check out our page and help us to keep Radio Westeros going through TWoW and beyond! Some of our listeners may have heard that we are in the process of changing our podcast provider, and our brand new website is a result of that change. Many have asked what the change means to subscribers, and the answer (hopefully!) is “very little.” The delay in posting our new episode is due to our efforts to make sure this change is as seamless as possible from the outside. If you subscribed to us using the RSS button on our old website prior to October 1, 2016, you might need to resubscribe (or not, depending on how frequently your feed catcher is set to update) If you subscribed to us via iTunes you should see no effect from the change. Same for our YouTube listeners, as that is an entirely separate entity. And that’s it! Other than the pesky delay in publishing the next episode, we hope that inconveniences are at a minimum. Thanks to everyone for the support and patience as we complete this transition to making Radio Westeros a better product for you. Stella & Dot Fundraiser — Because Winter Holidays are Coming! Now through November 4, 2016 US listeners can shop Stella & Dot’s beautiful jewelry and accessories to benefit Radio Westeros! Many thanks to listener and S&D Stylist Ashley Ribeiro for sponsoring the trunk sale. It’s not too soon to start thinking about spring conventions! Register now for Ice & Fire Con and join in the fun with games, panels, cosplay, fandom favorites and more. Click below for more information and to register & remember to tell them Radio Westeros sent you! Although our t-shirt fundraiser is over, we can still order t-shirts directly from Custom Ink. The cost is $30.00 which includes shipping and handling* and takes about two weeks. If interested, please send the funds via PayPal (see link in sidebar) with a note saying “t-shirt” and send an email (see About Page) with your requested size and shipping details. *For orders outside the US, please message us about additional shipping costs.